The CIR-3PS+ Customer Interface Relay provides two isolated solid-state dry contacts from a single Form A or C input, and a single end-of-interval (EOI) contact. One set of contacts may be configured as either a Form A (K & Y) or a Form C (K, Y, & Z) contact. The second set of contacts is a fixed 3-Wire Form C output typically used for a pulse recorder or other utility instrumentation. The EOI output is a dry Form A contact. The typical application is the utilities’ interface between the KWH meter & recorder and a customer-owned energy control system. 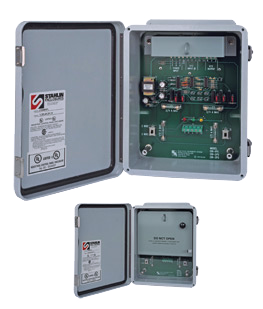 The CIR-3PS+ includes everything necessary to provide a customer with energy pulses in one compact ready-to-use weather-resistant NEMA 4X enclosure. The CIR-3PS+ is internally divided into two compartments. Once installed, the upper compartment is normally locked and only accessible to utility metering personnel. It contains all of the electronics along with fusing that is coordinated with the fuse contained within the customer compartment. The lower compartment (customer compartment) contains a terminal strip, fusing, output status LEDs, and two switches which allow the customer to choose either a 2-Wire or 3-Wire output, and either a short (fixed) or “long” (actual) duration for the end-of-interval timing contact closure. The fixed duration period is selectable at 100, 300, 500 or 1000 milliseconds. For the customer’s KYZ output, with the switch in the two-wire mode, each relay contact closure is approximately 100 milliseconds long and occurs each time the 3-wire input changes state thereby doubling the pulse value automatically for Form A applications. The red LED will only light each time there is a contact closure. With the switch in the 3-wire mode, the relay contacts “K” and “Y”, and “K and “Z” directly follow the input’s status. In this mode, both the red and green LEDs light alternately depending upon input’s status. A yellow LED in the customer’s compartment shows the status of the EOI circuit. The use of LEDs in the customer’s compartment allows a rapid visual check of the system’s performance without requiring any additional test equipment. 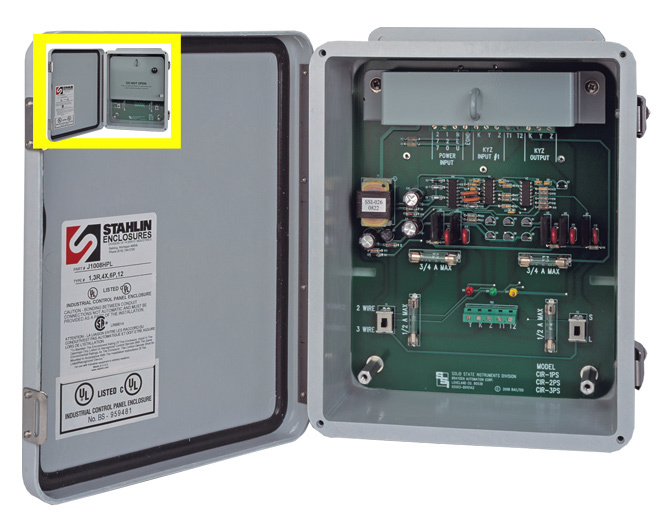 Because of the redundant, coordinated fusing in both the utilities and customer’s compartments, the meter shop service coordinator can usually determine the location of the service problem as to either utility or customer responsibility by the simple question “are the LEDs flashing”. The double “K” lead coordinated fusing of the CIR-3PS+’s output will prevent damage to the relay under almost any condition a user might cause such as that caused by excessive current, incorrect wiring, etc. The CIR-3PS+'s robust solid state switching device is rated at 800V and 750mA giving maximum protection from lightning or transient voltage damage. The CIR-3PS+ has built-in transient protection for the solid-state switching devices that eliminates the need for external or off-the-board transient suppressors. Pulse Output: Three sets of dry contact solid state outputs. Output 1: one field-selectable set of Form A or Form C dry contacts (K & Y or K, Y, & Z) selected by a user-changeable switch, located in the customer’s compartment for energy pulses. Output 2: one fixed set of Form C dry contacts located in the utility compartment for energy pulses. Output 3: one fixed set of Form A dry contact located in the customer compartment for EOI timing pulse.